%WINDIR%\SYSTEM32\RESTORE\rstrui.exe: opens Tool System Restore (for XP only). MRT : launches the utility removal of malware. SFC / REVERT: return the initial configuration (For more information, type SFC /? In the command prompt CMD. Hello, yes, apologies for being obtuse. I've been looking for a way to uncap Sonic Generations' 60 FPS cap. Tried googling everywhere, using DxWnd + D3DOverride to see if triple buffering would uncap it, some Cheat Engine nonsense, unpacking the files looking for a solution, etc. etc. I did edit the comment in the hopes that someone would offer a solution (or perhaps an elaboration) on high framerate performance in the game. Anyways, the user which posted the original comment is MOJ, but I haven't seen any particular explanation of his claims nor do I have any particular way to get in contact since his Steam account link is broken, unless he still has a Hotmail (Hotmai?) account. Can you add him on Origin? Reply to "Sonic Generations FPS Cap"
Yes you did, but there were no uninstall instructions. Not any obvious ones that is. Granted I forgot to remove the downlaod from bit. My mistake! I noticed you added it now so thanks! Wait hold on I messed up that explanation I'll re-write it. Why did you remove that section? Did I not word it correctly? Please feel free to rephrase it but that information is definitely accurate. It's unclear. I don't even know what it means, I'm not going to to re-write that. It would be a whole lot clearer if you simply said that the image gets stretched. 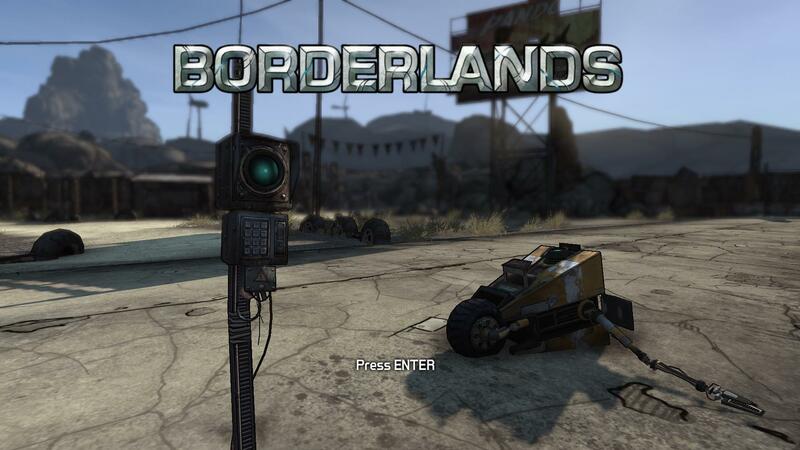 Have you tried other borderless programs to see if they stretch the game as well? (I don't have this game myself). Stretching is not the correct result. If all programs stretch borderless should be marked as unsupported with the stretching mentioned in the notes. 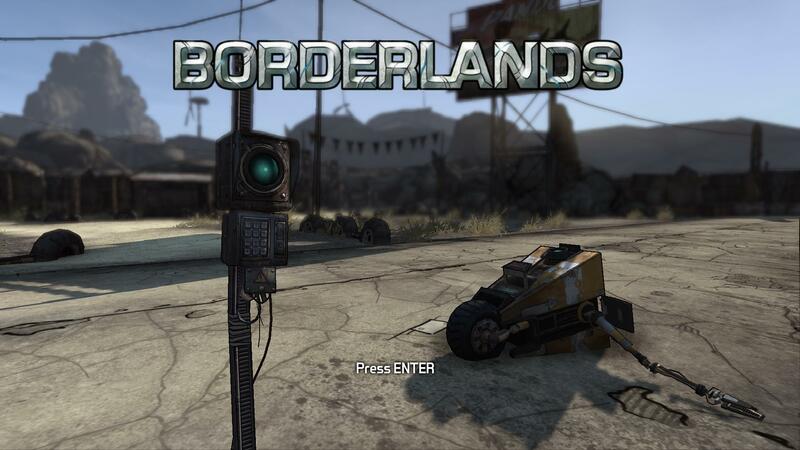 Reply to "Borderlands - Borderless Gaming section"
The InsectLoader hack works just fine in multiplayer, which I would imagine is what gets played the most. You only get the weird issue where your camera scroll breaks in single player. I've never had it crash as I complete a level in the campaign, although I can't confirm it doesn't happen to other people. I don't remember what I had tested, there was another widescreen solution, which kinda worked (not sure if it still was this), the game loaded, but there were graphical glitches everywhere, and then it crashed again. I remember this working on Windows Vista or XP, but I don't remember what version of the fix I had used. It would be nice if there was a less hacked in/more stable solution. I don't really have the time or patience to look for a similar fix, if you wish to you could just add the edit back onto the page. Hm...that's strange. I'm on Windows 8.1 x64 and it works just fine for me. Are you running it with admin privileges? Yeah I just ran InsectLoader.exe without admin privileges and that's exactly the error message that I get. So yeah, it's not broken. It just needs admin privileges. As I said already, I don't have time for this, just add the edit back. I don't care right now. Reply to "StarCraft Widescreen Resolutions - InsectLoader.exe works just fine"
You can make a compatibility package with the Microsoft Application Compatibility Toolkit and include a batch file to install/uninstall it. See my various uploaded fixes for the batch files (e.g. Grouch/Rocko's Quest low frame rate fix). A smaller selection of flags can be set in an application manifest but I have not tested this approach. I kept trying to find that tool as I lost it a while ago, thanks. I have no idea how to use that manifest thing, it's so clusterfucky and explained so poorly. Reply to "Packaging compatibility settings"
Hi, I made this screenshot comparison for Fez at 1440p, 1080p, and 720p. I did this because the Internet is vague on how exactly Fez looks at each resolution. The claim is that Fez really renders at 720p, and everything else is an upscale from that. I wanted to verify this claim, and show how the game scales. It was important to me to know whether I should run Fez at the highest resolution possible, or just run it at 720p. You said my comparison was "not of much use", so I hope I have changed your mind. It would probably fit in better under a note field as usually the right side of the page is used for screenshots like these http://i.imgur.com/K8aNfGo.png My idea was to mostly keep things a bit consistent looking, seeing as that screenshot looks a bit odd compared to the rest of the video settings screenshots, I usually like to keep most things neat looking. I don't exactly remember what other reasons I had when I removed that, you could just add the screenshot back. Maybe I'm just way too picky sometimes so, idk. It's just a habit I have to keep things pretty and stuff :v I do add back anything important if I have to though, even if I might cleanup some of the uglier less than readable pages. I don't think you should waste your time to make the screenshot look better, that's something I should probably do myself but it's not important really. Oh, I clearly remember now, to me it was almost way too tiny. It made it hard to spot some of the differences at a first glance. Your screenshots show that this game is not actually upscaled from a set resolution, so the resolution mention should be rewritten or removed. Actually, on hindsight, I still don't remember why I actually removed it. Because of graphical style used with the game, it's indeed designed to be played with 720p (basically designed to be played on Xbox 360, because most puzzles are designed with that controller in mind, also see key points for that game) and that's why 1440p is second recommended resolution as pixel count is exactly doubled then. 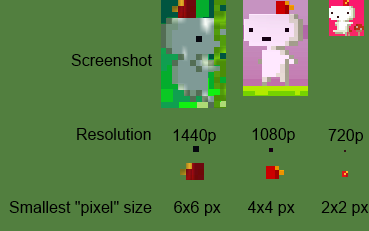 However that comparison picture doesn't tell everything unless someone opens it in image manipulation program, because for example fez hat character is wearing, actually has 5x5 pixels area while everything is mostly 4x4, you can see many areas in screenshots where zoom is handled like that and it almost has to be because of games graphical style. Because we are talking about that minor difference, there's almost zero effect on gameplay and of course it's better to play with monitors native resolution, because down/upscale would ruin the games visuals far more. Spoilers about the game included about game ending. Where it shows best it's actually not an upscale is indeed first person view which is unlocked as without any AA applied it's super clear it's not upscaled from lower resolution. Also moving objects around regular 2D enviroment. Question: as game does have first person view and stereoscopic anaglypth options available as unlock. However should they be on article as they also count as spoilers to the game? The inclusion of 3D support should be covered. This wouldn't need to specifically mention the other feature unlocked along with it. Reply to "Fez Screenshot Comparison usefulness"
So why is it we're allowed to post links to software which modifies the exe of games yet I'm not allowed to post my skip intro fix? There is now an automated tool for this fix, but note that adjusting the EXE reportedly causes an issue with a mission (see Ceano's comment on this page). You could get banned by editing the exe, I wouldn't do either. Until someone knows how the detection system works, it's too risky. I don't trust R* vague answers. Better safe than sorry. And editing the main exe just to remove one intro video is extremely stupid, someone should figure out some better way of doing this. The first splash screen isn't that bad anyway, it's only 10 - 15 seconds approx, and it's not worth risking your account getting banned. It's not that I don't hate it, but lots of people might be using this page as a reference. Until someone provides some real proof that this doesn't get you banned, along with the FOV hack and that weird mouse thingy, then I'd be careful about what I change. Reply to "GTA V skip intro"
Do The Sims 2 still need a cleanup? I think the page looks much better than back in July 2014. Do you think it will be time to remove the cleanup template? It still looks messy to me but I don't care. Let me guess, it's because of the 'The Sims 2 Store' and the 'Version differences' sections? No, there's more than that, but I can't be bothered right now. As I said I don't care, do whatever you want. Reply to "Do The Sims 2 still need a cleanup?" The WSGF screenshots show a stretched output. When the output is stretched it counts as false even if widescreen resolutions are listed in-game. Reply to "Walt Disney World Quest: Magical Racing Tour widescreen"
The earliest release date is listed for a platform even if the release was only in a foreign language or a single country. Each OS currently gets only a single release date entry. I added both release dates mainly because two versions of the game exist for some reason. I didn't know how to leave an empty row in the Windows field thingy. I don't know the differences between each though, I'll just add the earliest possible date if this happens again. Reply to "Multiple release dates"